Musicworks invites writers to submit brief query letters. A good Musicworks article digs deeply into the experimental sound art practices of concert music, electronic music, improvisation, instrument making, avant pop music, and visually-oriented experimental music genres (listed below). 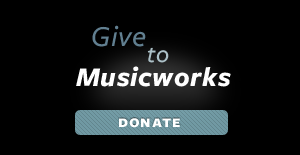 Musicworks provides jargon-free, engaging access to experimental sound's creators, performers, and ideas. Our readers are passionate and knowledgeable about experimental music and expect to discover compelling stories, new ideas, and in-depth reportage. Before submitting a pitch please read a print issue and familiarize yourself with our content and tone. We do not accept submissions of previously published work. Our lead times are long. We publish tri-annually and plan issues well in advance of their publication dates. The March issue is planned in the previous fall, the June issue is planned in February, and the October issue is planned in June/July. Please keep this in mind when pitching articles that are linked to events and dates. Musicworks has a small staff and receives a lot of pitches, however we generally reply to pitches within a couple of weeks. Please make your query succinct. It should explain what you will be writing about, your unique point of view on the story matter, what makes the story timely, and why it is a good fit for Musicworks magazine. If you haven't written for us before please attach links or documents with examples of your writing. Our features are 3000-word articles that provide our readers with compelling stories about experimental music that are not heard in the main-stream music media. Commercial music gets a lot of coverage and we want to engage the public by shining a light on the diverse and adventurous world of experimental sound art practices. Your story should offer our readers background to your subject, and ideally include at least one core interview, while digging deep into the sound, creative process, and context of what you are covering. Interview a musician about the work they are creating while they are creating it and give our readers a behind-the-scenes glimpse of the experimental music while it is being made. Sound has a story to tell. Have you visited a place with a unique sound space, or can describe the sound of a location in a unique way? This is the place to describe your experience of sound out in the world in a literary journalistic style. Think of this article as a mini-profile that introduces an up-and-coming experimental musician in a one-page feature. Be the first to introduce our readers to unknown artists. Have you experienced a sound installation, sound sculpture, or video music that benefits from being seen as well as heard? This is where we tell (and show) our readers about pieces that are visually striking. We publish short reviews of experimental music recordings, events, labels and publications. In the Web-only Review Spotlight, we review new recordings of music composed by Canadians and significant Canadian music or sound events that feature a significant amount of Canadian work.